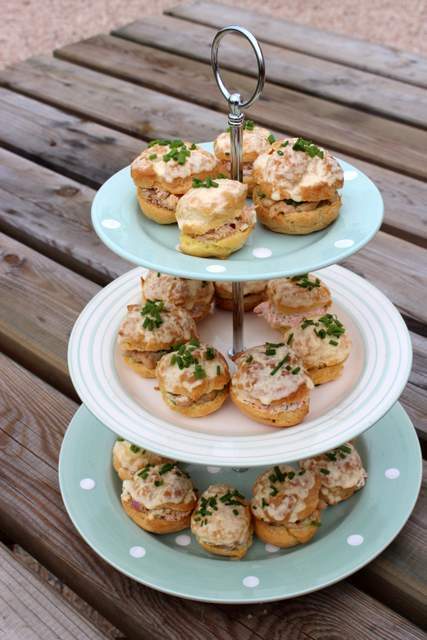 Home » Blog » Seafood Surprise Choux Buns! 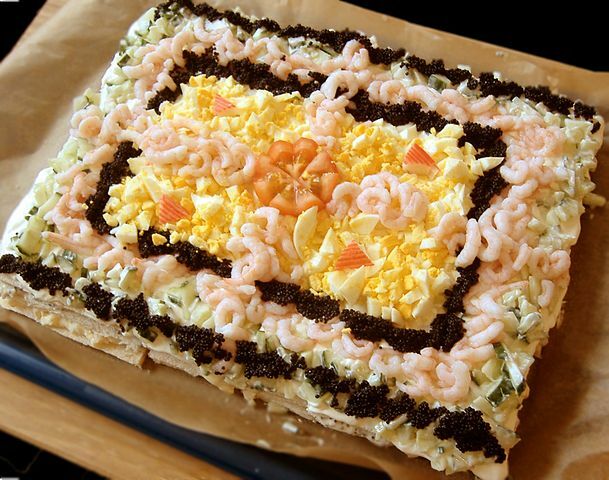 In Sweden they have something quite curious called a Smörgåstårta, which is essentially a sandwich cake. They are absolutely beautiful, but perhaps a little strange sounding to us Brits. 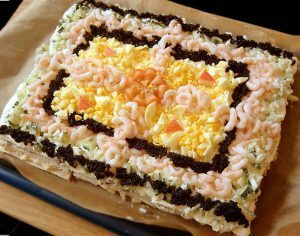 The idea is to build up layers of bread with various savory fillings that could include egg, prawns, salmon, ham and many other variations. Once it is built, it is usually covered with cream cheese or creme fraiche which resembles icing and so gives the whole thing the look of a typical ‘cake’. These ‘cakes’ can be quite extravagant affairs, adorned beautifully with many garnishes and served at special occasions. Sliced just like you would a sweet cake, I love that they play with the notion of what a cake should be. Unexpected, delightful and lots of fun! 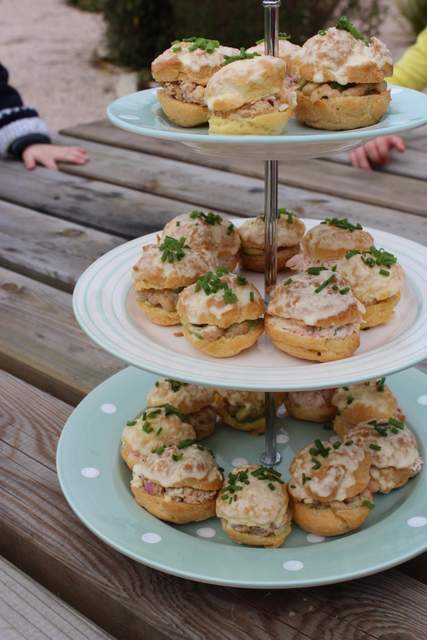 So, when I saw a recipe card in my local supermarket for savoury choux buns filled with tuna, I was reminded of the Swedish Sandwich Cake and this idea of getting something you weren’t expecting! Basically a savory profiterole, how wonderfully irregular! I have a recipe for choux that never lets me down so I used that to make the little balls of light golden pastry. It’s from part of a recipe in Olive Magazine and having tried other recipes that failed miserably, it’s good to have one you can rely on. 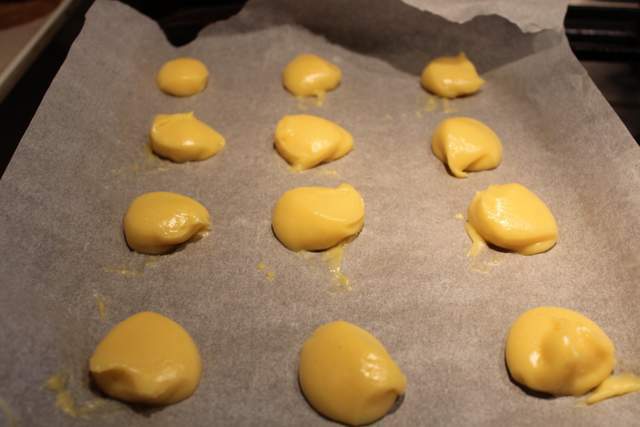 Choux pastry can be a bit tricky. I made my buns and then sat down to watch a recently recorded episode of Masterchef where one of the contestants choux buns did not rise properly and ended up like hard little balls. I felt her pain from old (but also smug that this time, mine were sitting perfectly pert in the kitchen!). Anyway, on to the filling. Taking my inspiration from the many varied layers in a Swedish sandwich cake, I decided to make three different fillings for my choux. Firstly, a fresh poached salmon, cream cheese and dill mixture. Secondly, prawns and avocado with a light spicy sauce. And finally, tuna, egg and red onion mayonnaise. Each filling is distinct but all are fairly creamy so that they hold together well. You could of course fill your choux buns with whatever concoctions you like! I guess you could view them as a type of mini sandwich, just a lighter vessel for filling than bread. In fact, when I served them I used my cake tier stand which made me think how wonderful they would be as a first course followed by some dainty sweet cakes all washed down with some afternoon tea. Tea time elegance; how very fashionable! I also topped each bun lid with a mayonnaise glaze which represented icing, adding to their cake like mystery. I took this idea straight from the recipe card although I have tweaked it a little. The basic idea was to heat mayonnaise with some water and dissolve some gelatin into it so that the glaze sets on the bun lids. I found it was a little thin and so I have reduced the amount of water in the recipe below. That should make it thicker and stickier. So if you ever want to impress someone with a classy afternoon tea whilst also stupefying them when your cake like buns turn out to be savoury (oh the hilarity! ), then knock up a batch of these little gems and sit back and enjoy the fun! You may find you have some filling left over from these amounts. Just keep in the fridge for a sandwich another day. Heat your oven to 200C/180F. 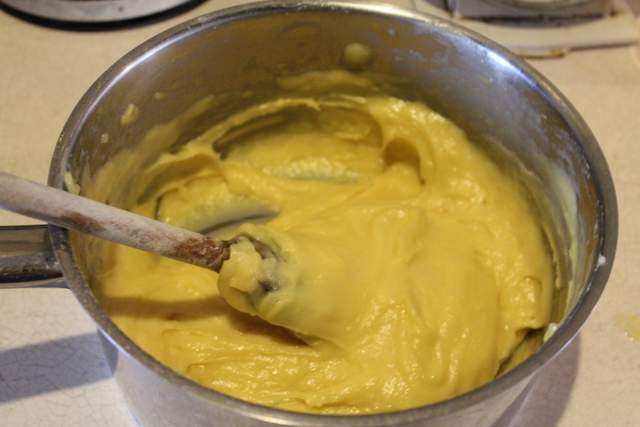 To make the choux pastry, melt your butter in a pan in the water. Bring just to boiling point and tip in the flour and beat hard with a wooden spoon for 15 seconds to bring it all together quickly forming a paste which leaves the sides of the pan. Let this cool to room temperature. Once cool, you need to beat in the eggs, one at a time so whisk one in a separate bowl and then pour it into the paste and beat until combined. Repeat with all the eggs. The mixture should be smooth and glossy. Line 2-3 baking trays with baking paper and then either pipe or spoon teaspoon sized balls of the dough onto the trays. Bake for 30 minutes until golden and puffed up. Leave to cool on a wire rack. Make each of your fillings. In a bowl, flake your salmon fillet, add the lemon zest & juice, cream cheese and dill and mix. Season. In another bowl, mix your defrosted prawns with the avocado, teaspoons of mayonnaise and ketchup and worcester sauce. Season. In another bowl, flake the tuna, add the chopped red onion and chopped egg and 1 tbsp of mayonnaise. Gently cut the top off each of your buns to make a fillable bottom and a hat to top. Then start filling them up! In a small saucepan, gently heat the 5 tablespoons of mayonnaise with the water. In a separate bowl, soak the gelatin sheets in cold water for 5-10 minutes until soft and gloopy. Lift them out and squeeze to get rid of excess water then add to the warm mayonnaise and whisk in. Remove from the heat and leave to cool and thicken. 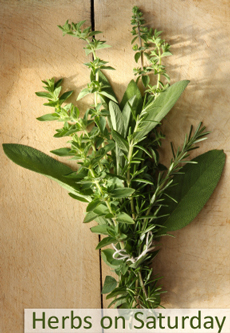 Once cool, you could pop it in the fridge for a few minutes to quicken the thickening process. Once it has thickened enough to coat the back of a spoon and stay there, take each of the bun lids and dip into the glaze to coat. Pop back onto each bun and then place the lot in the fridge to set properly until ready to serve. Top with a few chopped chives if you like. I am entering this recipe into this months Herbs On Saturday hosted by the creator of the challenge, the lovely Karen from Lavender & Lovage. 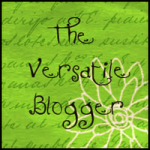 I am also entering for the first time into the Clever Chicks blog hop full of clever ideas, recipes, family stories, DIY tips, Tutorials and much more! 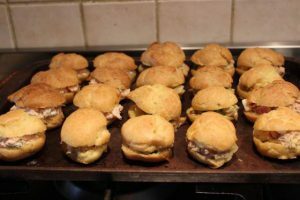 14 Comments on "Seafood Surprise Choux Buns!" Oh just how dainty and delicious do these look?! I’ve yet to try my hand at choux pastry but I’d love to give it a go, and shall naturally be using your Olive recipe and hoping I have as much luck as you. Loving the idea of savoury profiteroles too, and each and every filling sounds fishily scrum! Hey Lou! Glad you like them. 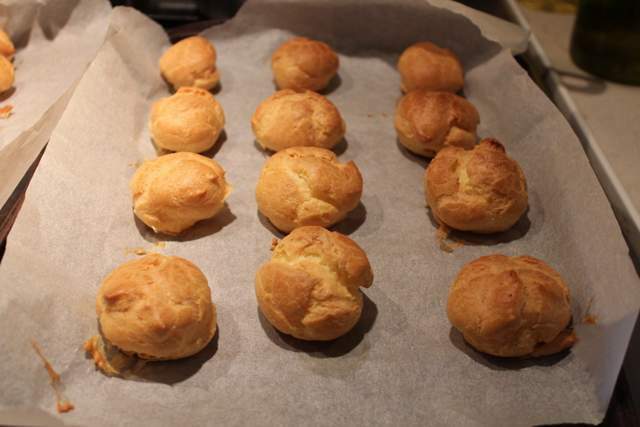 Definitely use this choux recipe here…it’s a winner. It’s nice to make these savoury ones but I must say that when I finished them, I was craving some cream and chocolate ones. I think I may have to play around with the typical sweet ones too. That could also be fun! Thanks Karen. Link added now. It was a bonus to be able to take the photos outside for the first time in months. Summertime food always looks so good ! Thanks Mark. You are right, they would be lovely served at a Summer wedding. Much prettier than sandwiches I think. Perfect with a nice cold jug of Pimms & lemonade. Oh yes please…. because really, it is simply fun to say “buns” when writing up a recipe. buns, buns, buns. cute yummy choux buns. Are you saying you like my buns? !! I love buns…. So cute, I think these would make a perfect canapé or afternoon tea treat. I love a savoury choux bun as much as a sweet one. Anything with seafood or cheese would get my vote! Thanks Laura! They do indeed make a very pretty canape! I agree that some cheese would also suit well. I love the sound of these buns – what an excellent idea. We always make sweet ones so these would make a lovely change… Well done !